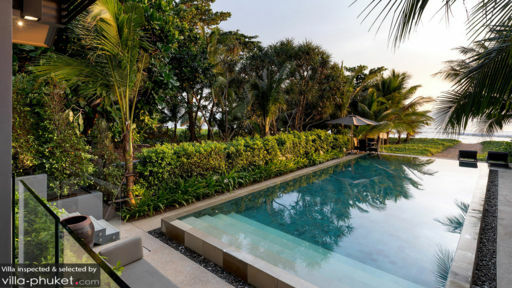 Infinity Blue Phuket along the shores of Natai beach is a slice of paradise with four bedrooms, sweeping views across the ocean, and plentiful fresh air to keep you refreshed and relaxed for the duration of your stay. Just under 30 minutes from the airport and nearby sights, the villa is a serene haven meant for those who wish to retreat to nature for a peaceful holiday with friends and family. The 15-metre pool is the crowning jewel of the villa with its spectacular mosaic floor and even more splendid ocean views. The villa houses four bedrooms that are fully-furnished with double bed and queen-sized beds, lounge chairs, and desks. The bedrooms are absolutely comfortable with sliding glass doors that lead directly outdoors. 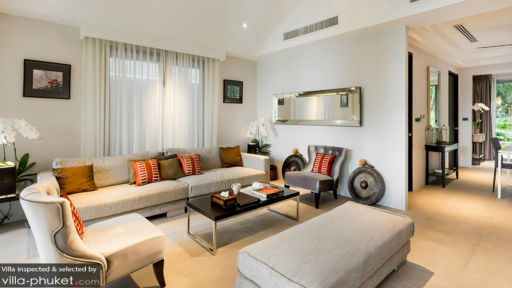 With televisions and other modern amenities, there is nothing you will want for while staying at Infinity Blue Phuket. The beds are draped with traditionally woven bedding and you will find the rest of the room to be quite minimal for a luxe vibe. En-suite bathrooms are quite expansive with modern fittings, walk-in showers with glass doors, spacious vanities and other amenities. Following a dirt path that extends out from the villa, bordered by patched of lush gardens, one can easily head down to the sandy shores of the beach. The ease with which you can access the coastline is one of the most striking features of Infinity Blue Phuket. At the villa, its 15-metre swimming pool is the perfect spot to cool down with a chilled cocktail while you relax and enjoy the panorama and its scenic beauty. The landscape itself is marked by beautiful ponds, verdant foliage, palm trees, and meandering routes that can take you anywhere and everywhere. Outdoor dining beside the ocean is a reality for the most romantic and intimate way to spend your meal time. Through glass doors that slide open to the wondrous view outdoors, you will reach the modern living area at the villa. With sheer, white curtains to siphon off the light, you can truly relax and let loose on the comfortable sofas that are done up in earthy neutral tones. The slick, elegant furnishings ensure there is more room to breathe as it is easier for you to unwind. There is a stunning corridor with a pergola roof overhead that allows in rays of sunlight reflected on the many mirrors. For dining, Infinity Blue Phuket offers various ways in which you can make the most of your time here by either enjoying a feast beside the ocean, or an intimate dinner in the open-sided dining area or a more casual meal with loved ones indoors. The fully-equipped kitchen at the villa is swanky and modern with state-of-the-art amenities and appliances for your use. 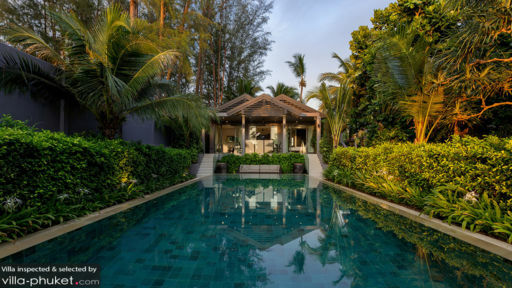 A fully-staffed villa is the way to a perfect holiday and at Infinity Blue Phuket the in-villa staff is extremely professional and discreet to help you get settled in and enjoy your time. There is Wi-Fi, satellite TV, DVD players, and iPod docks for your enjoyment at the villa as well. The serene surroundings of the villa are owing to its beachfront location so you have private access to the white sandy shores of the beautiful beach out front. The beautiful panorama is enough to keep you satisfied for days on as you relish the laidback vibe and easygoing ambiance. If you have a mind to explore the island head to Thai Muang for its turtle hatcheries or the Blue Canyon golf courses. absolutey wonderful i have just spent the most fantastic week at this beautiful villa - the position is amazing and the villa is kept beautifully. my only issue was that i had to leave. i will definitely be returning.